The Precor TRM 445 is the top treadmill in the company’s Precision series, offering Ground Effects Impact Control and Integrated Footplant tecnology, as well as touch screen display and Preva workout tracking. It represents the best that Precor has to offer, and has a price tag to match. Warranty : Lifetime for frame, 10 years for parts and wear items, 3 years console and 1 year for labor. 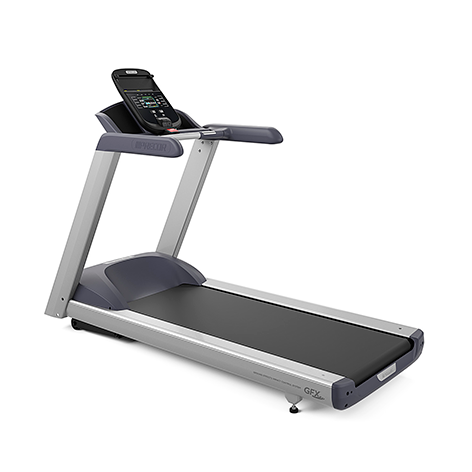 The Precor TRM 445 features two exclusive technologies only found on their top level treadmills. One is Ground Effects Impact Control, precise cushioning with shock absorbers in the front and a rigid back to push off of. The next is Integrated Footplant technology, which automatically adjusts the speed of the belt to match your natural movements, minimizing impact on your ankles, knees and hips. Both of these technologies work to maximize your workouts and reduce pain whether you walk, jog or run. You get a 7 inch color display with touch buttons, as well as lever controls, personalized suggested workouts and 4 user profiles. There are 23 preset workouts built in and 16 personalized workouts to choose from. The Precor 445 offers both grip and wireless heart rate monitoring, with a free wireless chest strap included. It also features SmartRate technology and when you enter your age and your weight it keeps you in one of three target zones. With incline and decline you can really ramp up your training (no pun intended! 🙂 and target all different muscle groups in your legs. The TRM 445 gives you Preva workout tracking so you can monitor your progress and set goals for yourself, premium full length handlebars, oversized water bottle and accessory pockets, 27 different readouts, full iPhone/iPod compatibility, tablet holder and a 3.0 CHP motor. The Precor TRM 445 treadmill is top of the line in every way. You get plenty of workouts, 4 different user profiles, Preva workout tracking, incline as well as decline, music integration and ground breaking technology to maximize your workouts. If we had to point out any negatives it would be the running surface is only 56″ long. Most treadmills, especially high-end ones, are around 60″ in length to accommodate taller users. Take a look at the Precision Series models, including the 811 and top-of-the-line TRM 835, for longer decks. Also, for the price tag (just under $6000), it would be nice if it came with internet access and perhaps some console choices. But all in all, the Precor TRM 445 is a solid commercial-grade treadmill that will last you for years and years with little to no maintenance required. It’s the same great machine you’ll find in your gym, only this one will be right at home in your home…if you can swing the price tag!